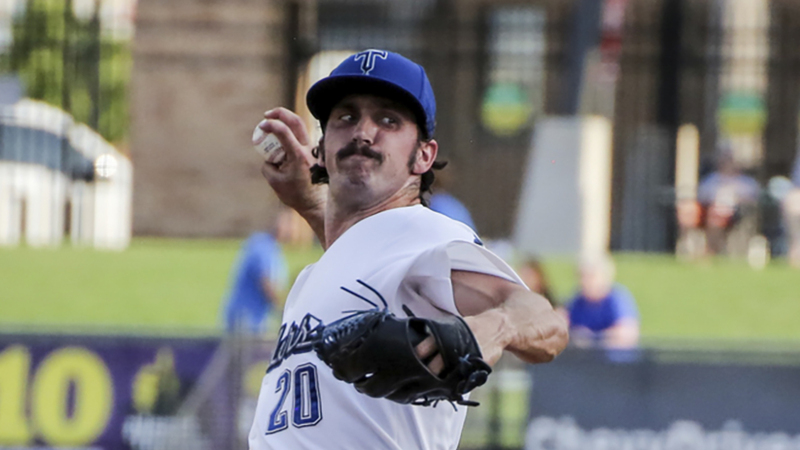 The Los Angeles Dodgers today named Tulsa Drillers pitcher Tony Gonsolin as the Branch Rickey Minor League Pitcher of the Year and Drillers infielder Gavin Lux as the Branch Rickey Minor League Player of the Year. Gonsolin and Lux joined the Drillers roster in mid-season and helped lead the franshise to its first Texas League title in 20 year. In 26 combined starts this season with Single-A Rancho Cucamonga and Double-A Tulsa, Gonsolin had a 10-2 record with a 2.60 ERA (37 ER/ 128.0 IP), striking out a combined 155 batters against just 42 walks. He began his season in the California League, posting a 2.69 ERA (25 ER/83.2 IP) in 17 starts and was named a Mid-Season All-Star before his promotion to Tulsa on July 14. The 24-year-old then dominated in nine starts for the Drillers, going a perfect 6-0 with a 2.44 ERA (12 ER/44.1 IP), a 1.08 WHIP and a .203 opponent's batting average. The Vacaville, California native was selected in the ninth round of the 2016 First-Year Player Draft out of St. Mary's College where he split playing time as an outfielder and pitcher before he transitioned to pitching full-time with the Dodgers. In 87 career minor-league games (26 starts), the right-handed pitcher went 18-10 with 10 saves, a 3.14 ERA (80 ER/229.0 IP) while striking out 265 batters against 68 walks. Lux started 2018 with Single-A Rancho Cucamonga batting .312 (72-for-231) with 8 home runs and 35 RBI and was named a Mid-Season All-Star. The 20-year-old continued his dominance in the second half of the season, slashing .346/.396/.528 and was selected as a post-season California League All-Star, and finished among league leaders in average (.324, 3rd), OBP (.396, 2nd), SLG (.520, 3rd) and OPS (.916, 2nd). After 88 games with the Quakes, the Kenosha, Wisconsin native was promoted to Double-A Tulsa where he hit .324 (34-for-105) with four home runs, nine RBI and a .408 on-base percentage in 28 regular season games. Since being selected as the first-round pick by the Dodgers in the 2016 draft, the shortstop has appeared in 283 career minor league games, slashing .288/.368/.432 with 22 homers, 54 doubles, and 117 RBI. Gonsolin and Lux will both be presented their respective awards and honored in a pregame ceremony at Dodger Stadium on Sept. 18 vs. Colorado. The Los Angeles Dodgers franchise, with six World Series championships and 22 National League pennants since its beginnings in Brooklyn in 1890, is committed to a tradition of pride and excellence. The Dodgers are dedicated to supporting a culture of winning baseball, providing a first-class, fan-friendly experience at Dodger Stadium, and building a strong partnership with the community. With the highest cumulative fan attendance in Major League Baseball history, and a record of breaking barriers, the Dodgers are one of the most cherished sports franchises in the world.